An eyeball route. This is close to what routing software was recommending when the race began. Initial winds suggested a route west of the rhumb. The question is how far west. 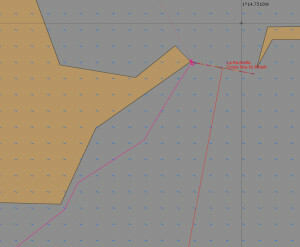 The image at right shows an “eyeball” route based on initial wind contours from Expedition’s [free] GRIB viewing software. 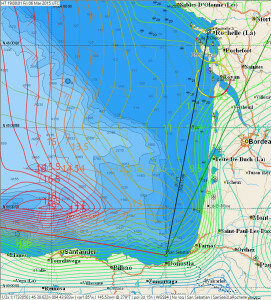 I find this wind contour display very helpful! IMO, at least half the value of “routing” software is the ability to display GRIB data in greater detail. Most routing software packages have that feature. GRIB display packages [like ZyGrib] provide that feature as well — and without the complexity of a router. The launching pad is set for the top finishers. As it turned out, exactly how a boat started out Friday didn’t matter nearly as much as where the boat was at 0800 [utc] on Saturday. At that point the fleet was spread across a graceful arc. But the top finishers were inside the area outlined in orange in the chart at right. And, at that point, the flavor of the race changed. What had been a loose, but routable reach on a heading a little west of north became a very technical curve. That curve extended through the next 21 hours and 75 nautical miles, as measure by Distance to Finish. From a TWD of 110° at 0500, the wind clocked to 164° by 1200. TWS fell from just over 10 kts to just under 8 kts. By 1800 the TWD backed to 91°, and TWS fell to 3 kts. From 1800 to javakeda’s finish at 0823, TWD clocked steadily to 331° — a swing of 241° in just over 14 hours. 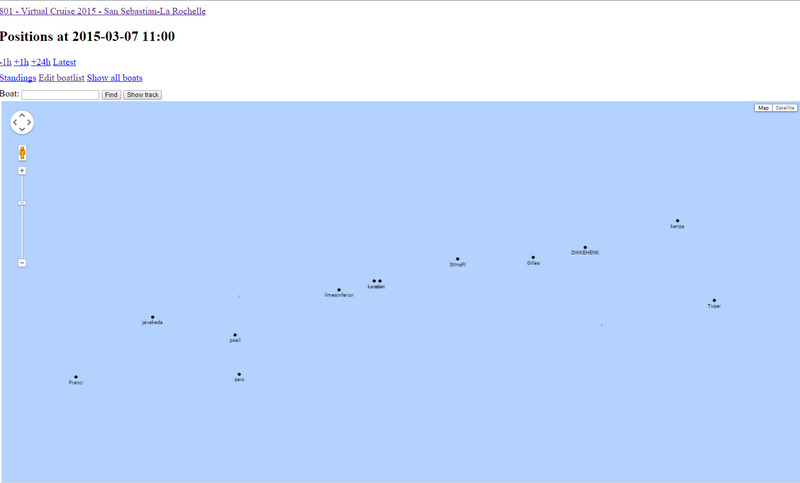 TWS fell to a low of 1.25 kts by 0300 on Sunday and recovered to 2.7 kts over the last five hours. 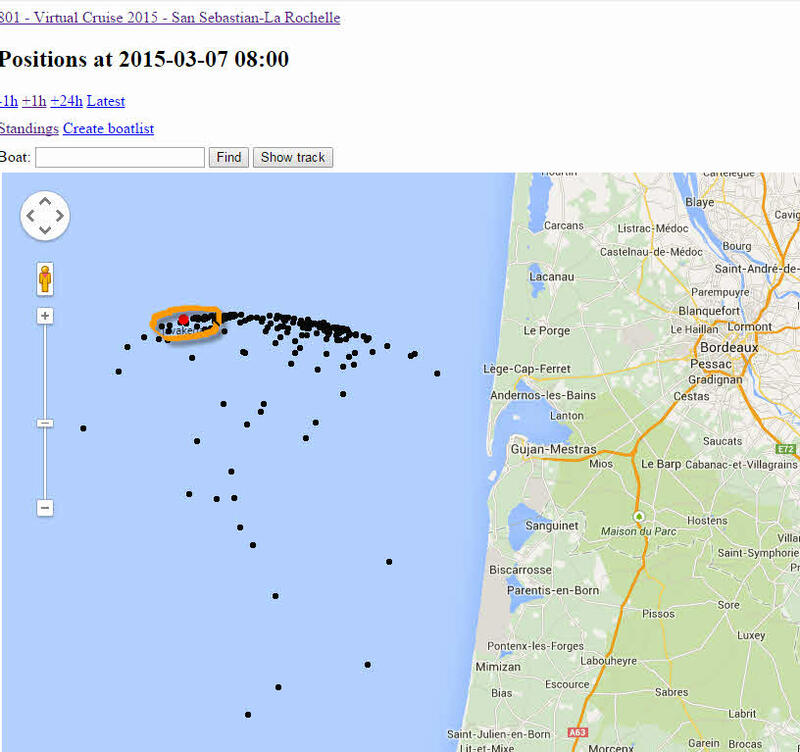 NOTE: These wind measurements came from [SOL skipper] hmm’s excellent sollog site for the race. 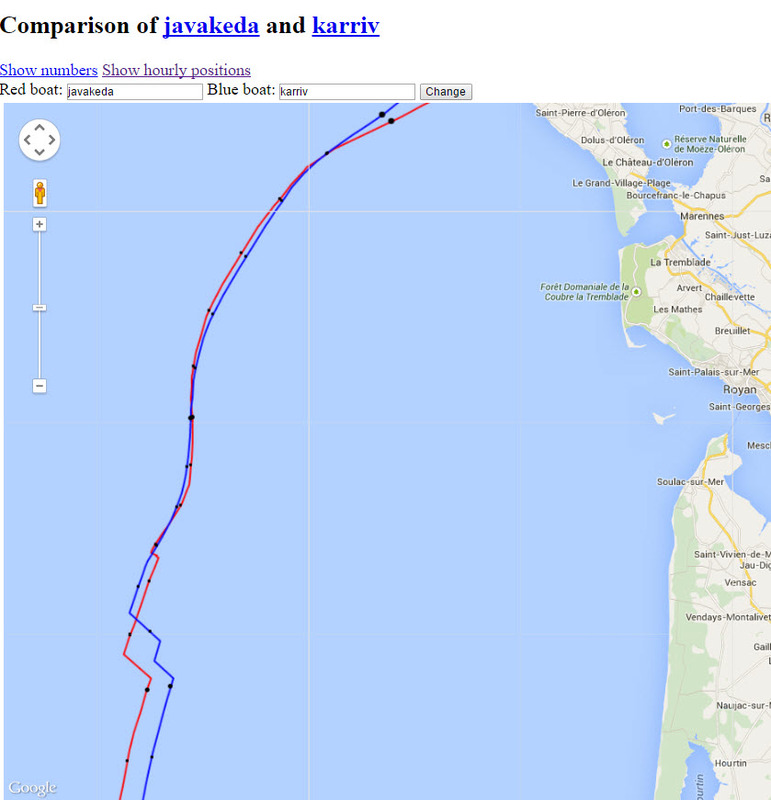 I used javakeda’s track and javakeda’s map to reconstruct the race javakeda sailed. Thank you, Markku! 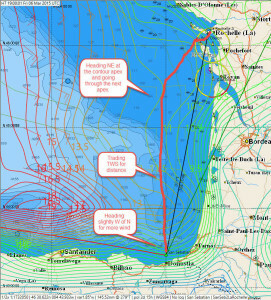 I ran routing software to generate suggested routes through the wind shifts. But there was no way I could just convert the recommended routes into DCs. The winds were too light and variable. 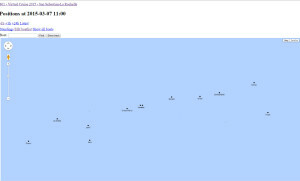 My routing software is better suited for open ocean. The results did gave me a feel for the shape of the route, and that helped. The most important feedback came from competing boats. The top finishers had, by this time, figured out they wanted to be in this general area. But it wasn’t clear exactly where, in this area, was best. I identified karriv as my primary competition. – our routes appeared to be similar. – I knew him to be a top skipper. I figured if I could stay ahead of him, I would be in good shape with the other boats. I wanted to stay outside of karriv for both match race and router software reasons. Just after 1200Z Saturday we had what I regard as a gybing duel. DIKKEHENK and atlet had gone west for more wind, and to stay outside of me! If the 0430Z / 1030Z WXs had been a little different, they might have scored ‘big time’. But the WXs stayed ‘neutral’ and the result of the gybing duel with karriv was ‘parity’ at 1800Z. In the SOL chat I asked if someone were willing to take karriv ‘clubbing’ on this fine Saturday night. I was willing to buy the first round of drinks. Karriv replied that he would NOT be going ‘clubbing’, but he would miss the 0430Z WX in the interest of avoiding sleep-deprivation. I felt both relieved and disappointed. That decision meant he would be setting ‘safe’ DCs . The way this race was going, that would probably take him out of contention for the win. OK, good for me — but what about the competition thing? Immediately after karriv checked out, StIngFI arrived. 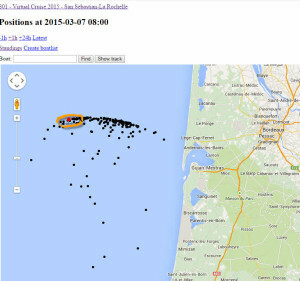 StIngFI had been slightly south of javakeda. Javakeda was ahead. In theory, all I had to do was ‘cover’. The cover involved three gybes and some serious hand sailing — steering past the Ile D’Oleron by changing TWA every five minutes. In this way I could match the ‘shape’ of the path from the router to the actual positioning indicated by the SOL client’s TWA predictor. 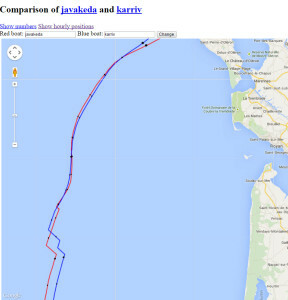 Once past the island, javakeda held a ‘comfortable’ lead of about 0.016 nm. 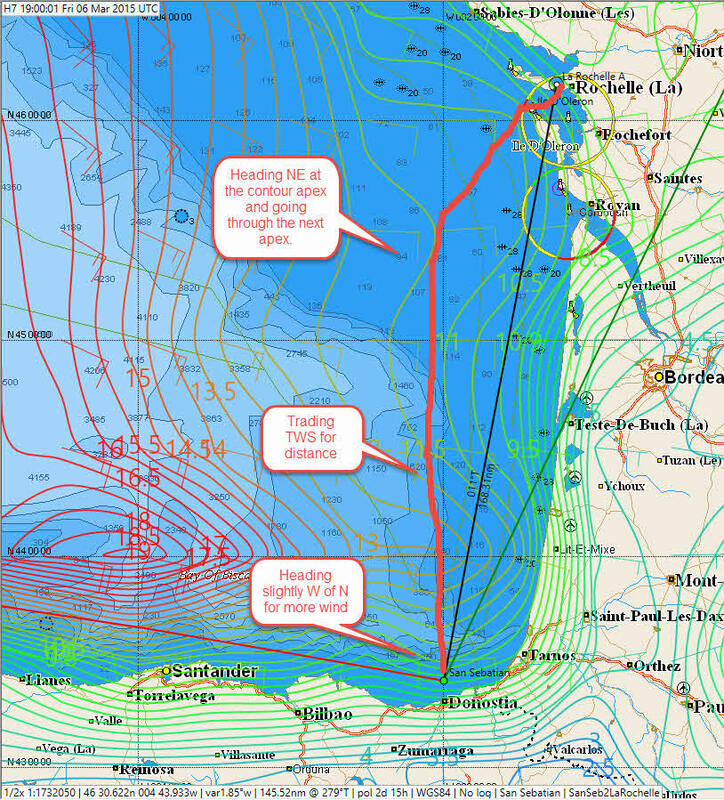 It says a lot about this race that, after 170 nm, a lead of some 320 yards is ‘comfortable’. Gilles suggested in chat that ‘java’ could just vector in, but life was not that simple. 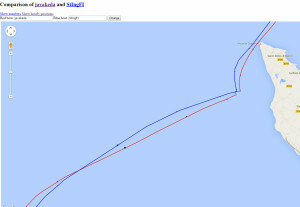 Completing the ‘cover’ on StIngFI required polar hopping between TWA = -90 and TWA = -60 on the way to the finish.